Next Generation is a Great Place To Work! 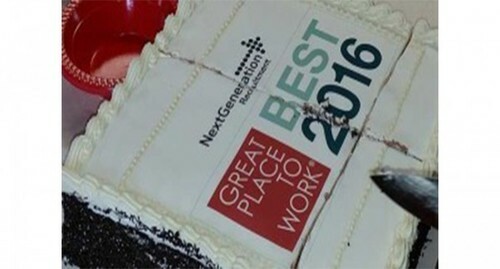 All of us at Next Generation were delighted to have officially been recognised as a Great Place To Work as one of Ireland’s Best Workplaces 2016. We celebrated with a casual Friday, a nice early finish and, of course, a staff party with our very own Great Place to Work cake. When we began the process back in May of 2015 we didn’t go into it looking for this award, nor did we envision receiving it, since this was our first year entering. We entered to see what we could do to improve our culture and work practises to make this not only a great place to work for our current employees but our future employees. Next Generation was established in 2007 with a headcount of just three, expanding year on year, and growing through both major recessions, we are now (as on Spring 2016) broadening into Europe and growing our internal headcount by 50% by the end of 2016. For these reasons and more, Great Place To Work was an ideal chance to improve on our already thriving culture by obtaining honest and unbiased feedback from our own employees. Fast forward 10 months and here we are, delighted to have earned this recognition as now, more than ever, is a great time to join Next Generation – and not just because we are a Great Place to Work! Recruitment as an industry itself is thriving and, for the right person,it is a role that is hugely rewarding both from a development and financial point of view. We are looking for people who align with our culture, our mind-set and our ethos to join us in continuing to make Next Generation a great place to work for all our employees. One of our biggest takes from the Great Place to Work process was that any company can have great benefits, great technology,well, great anything… but the largest part of being a Great Place To Work is your employees. Employees, as a group, live, breathe, nurture and develop your company culture. A lot of our most recent benefits, including annual leave for your birthday, increased annual leave based on length of service, casual Friday, leaving work early on Bank Holiday weekends just to name a few have come from feedback from our employees and we always encourage our employees for suggestions to make this an even better place to work for them. Now that we have this recognition it isn’t an excuse for us to stop seeking to improve as a Company as we constantly will try to seek ways to improve our culture and make Next Generation a Great Place to Work for many years to come. We are currently looking for people with varied backgrounds and experience – more importantly, we are looking for people with the right mind-set, drive, passion and an entrepreneurial spirit. So come join our team, our below infographic outlines just some of the reasons who you should. Interested? Simply contact Alan to discuss potential opportunities, in full confidence, on [email protected] or +353 1 6629120.